Smart lockout assists in locking out bad actors who are trying to guess your users’ passwords or use brute-force methods to get in. It can recognize sign-ins coming from valid users and treat them differently than ones of attackers and other unknown sources. Smart lockout locks out the attackers, while letting your users continue to access their accounts and be productive. By default, smart lockout locks the account from sign-in attempts for one minute after 10 failed attempts. The account locks again after each subsequent failed sign-in attempt, for one minute at first and longer in subsequent attempts. Smart lockout tracks the last three bad password hashes to avoid incrementing the lockout counter for the same password. If someone enters the same bad password multiple times, this behavior will not cause the account to lockout. Hash tracking functionality is not available for customers with pass-through authentication enabled as authentication happens on-premises not in the cloud. Smart lockout is always on for all Azure AD customers with these default settings that offer the right mix of security and usability. Customization of the smart lockout settings, with values specific to your organization, requires Azure AD Basic or higher licenses for your users. Using smart lockout does not guarantee that a genuine user will never be locked out. When smart lockout locks a user account, we try our best to not lockout the genuine user. The lockout service attempts to ensure that bad actors can’t gain access to a genuine user account. Each Azure Active Directory data center tracks lockout independently. A user will have (threshold_limit * datacenter_count) number of attempts, if the user hits each data center. Smart Lockout uses familiar location vs unfamiliar location to differentiate between a bad actor and the genuine user. Unfamiliar and familiar locations will both have separate lockout counters. Currently an administrator can't unlock the users' cloud accounts if they have been locked out by the Smart Lockout capability. The administrator must wait for the lockout duration to expire. Open the Group Policy Management tool. Edit the group policy that includes your organization's account lockout policy, for example, the Default Domain Policy. 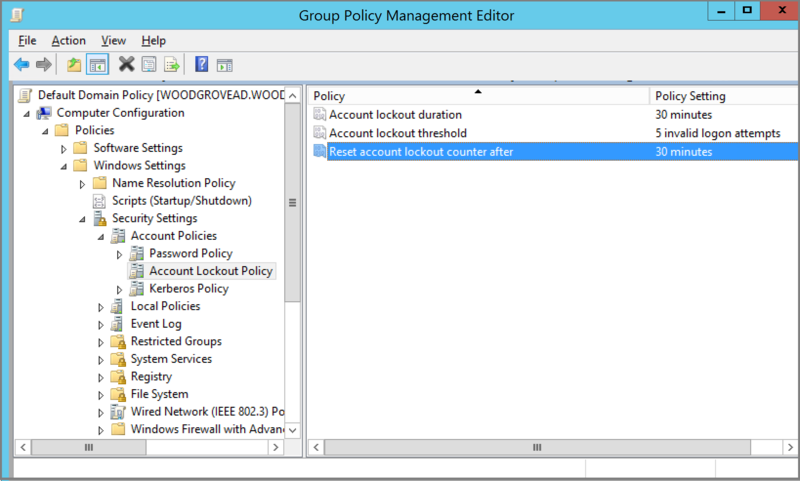 Browse to Computer Configuration > Policies > Windows Settings > Security Settings > Account Policies > Account Lockout Policy. Verify your Account lockout threshold and Reset account lockout counter after values. Based on your organizational requirements, smart lockout values may need to be customized. Customization of the smart lockout settings, with values specific to your organization, requires Azure AD Basic or higher licenses for your users. Sign in to the Azure portal, and click on Azure Active Directory, then Authentication Methods. Set the Lockout threshold, based on how many failed sign-ins are allowed on an account before its first lockout. The default is 10. Set the Lockout duration in seconds, to the length in seconds of each lockout. The default is 60 seconds (one minute). If the first sign-in after a lockout also fails, the account locks out again. If an account locks repeatedly, the lockout duration increases. Your account is temporarily locked to prevent unauthorized use. Try again later, and if you still have trouble, contact your admin. Find out how to ban bad passwords in your organization using Azure AD. Configure self-service password reset to allow users to unlock their own accounts.